The Hospital for Tropical Diseases offers free standard delivery for products weighing under 0.99kg. Sorry we do not ship to addresses outside the UK. 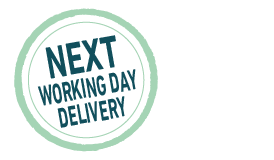 If you require your items fast, we offer a Next Day delivery service when you order before 2pm, otherwise your order will be shipped on the next working day. Next Day Delivery is £7.50 to UK mainland addresses. We aim to despatch all orders on the same day as we receive payment. Delivery to addresses that are not on the UK mainland may be subject to an additional fee. The Hospital for Tropical Diseases shall not be liable for any cost or damage caused by late or non-delivery of products. The product must be in its original packaging and in a re-sellable condition.